Yally is incorporated to develop products that help people see, hear, think, feel and speak. 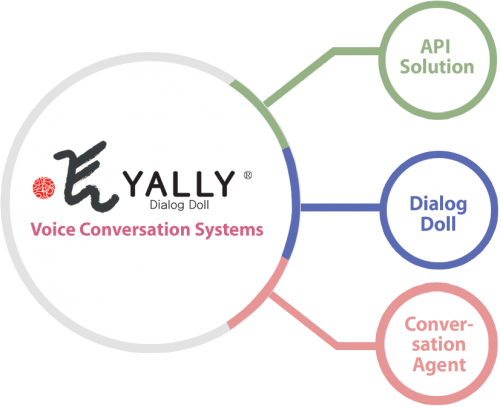 With the recent development and introduction of a host of speech-enabled, interactive, intelligent toys for Korean and international consumers, Yally leads the development of voice conversation systems. Capable of engaging in not only everyday conversations but also multilingual, emotional, informational, recreational, and a range of other types of conversations, these toys are ICT products that could provide linguistic training for immigrant children, serve as a friend to talk to for solitary senior citizens and provide other differentiated services for a broad range of groups. The Company has secured some 100 intellectual property rights including 19 domestic patent registrations, 5 trademark registrations, 10 software registrations, 22 copyright registrations, 9 international patent applications, and some 40 domestic patent registrations. With the revenue goal of 20 billion Korean won for 2017, Yally stands out as a company specializing in interactive technologies that is recognized both domestically and internationally. 08 Developed Yally DVR System Ver. 1.0. 10 Developed Yally Mate, an Android application (Ver. 0.0.1). 08 Obtained the Venture Capital Funded Startup certification.